Thank you for your interest in the Roanoke Rapids Graded School District’s Pre-Kindergarten Program! Our school is funded by multiple programs: Head Start, NC Pre-K, and Title I. Our school is designed to provide high-quality educational experiences to enhance school readiness for eligible four-year-old children. The Head Start program is a federally funded, comprehensive preschool program that is designed to meet the social, emotional, nutritional, and psychological needs of young children and their families. Title I is the largest federally-funded program for schools in the United States. Its purpose it to provide all children with an equal opportunity to access a high quality education. Selection is based on academic need. 4 years old on or before August 31, 2019 and a resident of Roanoke Rapids. 2. The child's certified birth certificate. 3. Valid ID of parent/guardian registering the child. 4. Two proofs of residence documents: a lease or deed and a bill (power, water, gas, cable, or landline telephone) or residence affidavit (Complete at our central office (building B) and bring the person with whom you live with to do the affidavit along with a valid ID). 5. Proof of income for parent/step-parent living in home with child (one month's worth of income is needed) and other parent if they are involved. 6. A completed health assessment (completed on or after August 27, 2018) and current immunization/shot record is required by the start of school. Please note that applying for RRGSD’s Pre-Kindergarten does not assure that the child will be offered placement. There is limited Pre-Kindergarten space and eligibility will be determined for each child who applies and those showing the greatest need for preschool. We urge all interested parents to apply. Applications and all supporting documents (besides health assessment and immunization record) must be received on March 22nd in order to be considered in the first round of placement and May 13th for the second round of placement. Eligible applications received after the May 13th deadline will be placed on a waiting list and in a classroom as openings occur. 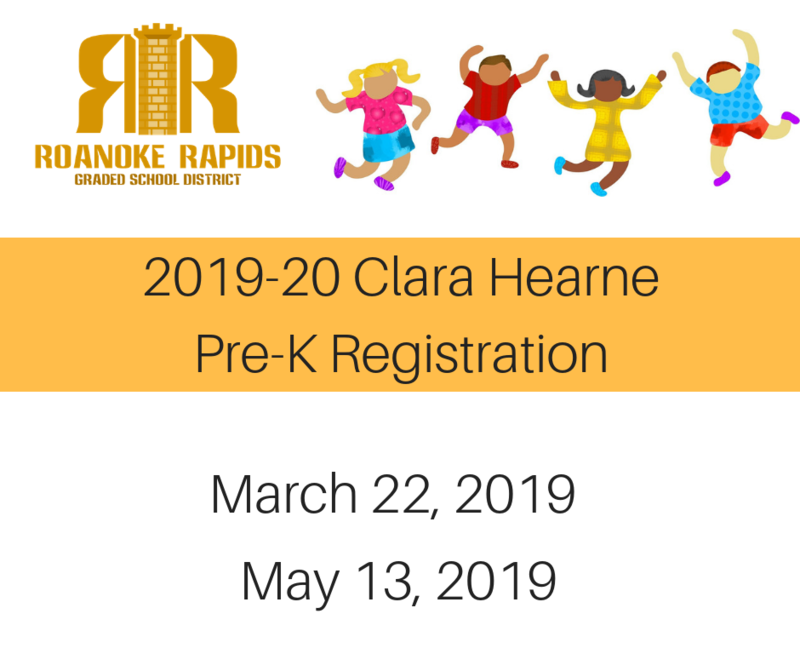 Our vision at Clara Hearne Early Childhood Center is to provide a child-centered environment for the educational, social, emotional, and physical development of each child while nurturing enthusiasm for learning and producing confident learners ready for kindergarten. All North Carolina Preschool Programs must use the North Carolina Foundations for Early Learning and Development. These standards address the following areas: Approaches to Play and Learning, Emotional and Social Development, Physical Development and Health, Language Development and Communication, and Cognitive Development. Teachers must use these early learning standards to guide their planning of high-quality learning experiences for children. In addition to NC Foundations, our classrooms use The Creative Curriculum and Teaching Strategies Gold. For an additional emotional/social curriculum, we use the Center on the Social Emotional Foundations for Early Learning.